This is a sponsored post. I was compensated and given complimentary materials to use, but the opinions in this posts are 100% my own. For all the surprises and joys in life, sometimes things can be just a bit… un-magical. Every now and then it is fun to escape on an exciting adventure to a colorful world. And those escapes often happen through a good movie. Oz the Great and Powerful is just the kind of movie that lets you get away for a few hours and immerse yourself in the gorgeous, lush world of Oz. But, as the Wizard will tell you, you can’t just drive to Oz, you have to take a balloon! 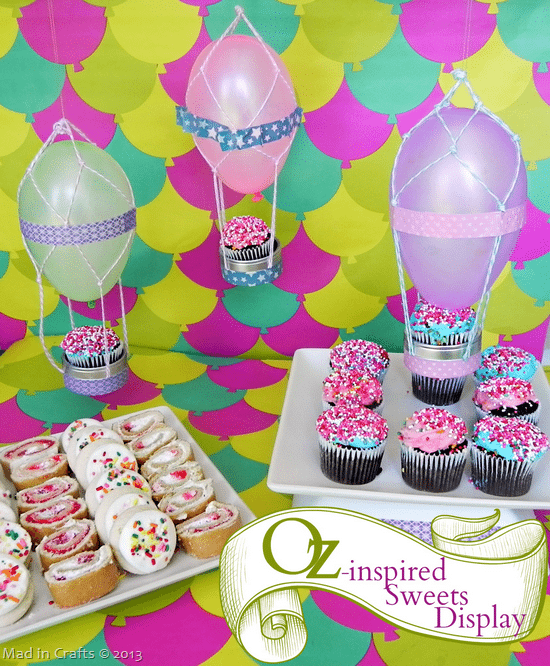 After watching an advance copy Blu-ray of Oz the Great and Powerful (and feeling super fancy while we did), I was inspired to make a sweets table that features a few handmade hot air balloon decorations. This dessert table would be adorable for a birthday party or baby shower, or a screening of Oz the Great and Powerful, of course! 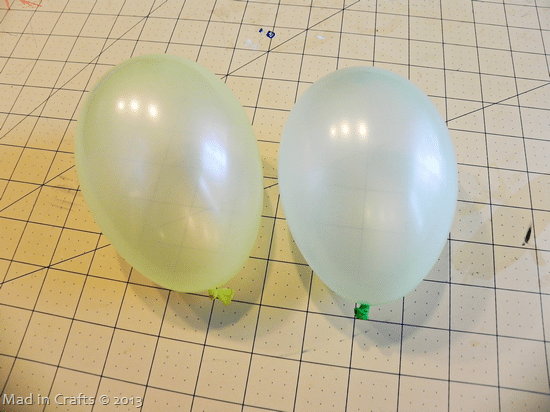 Blow up the balloons until they are roughly 5 inches tall and four inches wide. Cut 8 lengths of baker’s twine that are between 12-14 inches long. Tie them all together at one end. Separate the pieces of twine so that you have 4 pairs of two lengths of twine. Tie each pair together two inches away from the top knot. Pay no attention to the stripes on this balloon. NOTE: These pictures were taken while I was still in the prototype phase of this project. 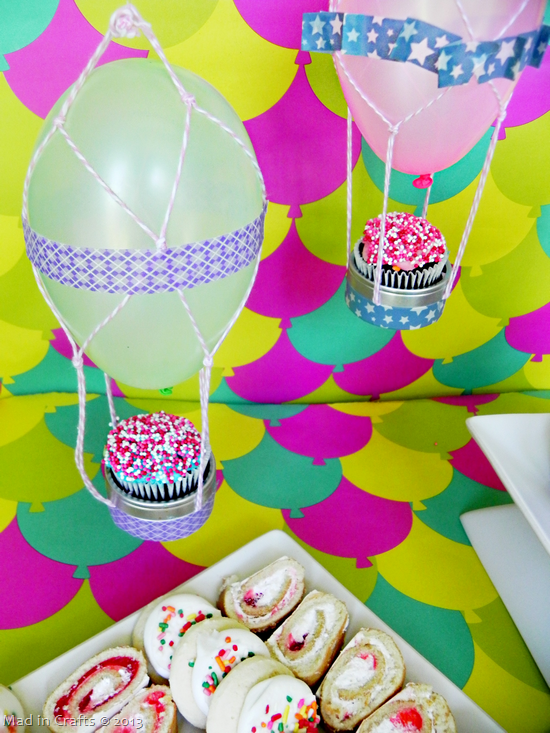 I initially put washi tape directly onto the balloons to decorate them. While it looked really cute, I found that after 24 hours, the balloons had shrunk enough to make the washi tape buckle and pop off. 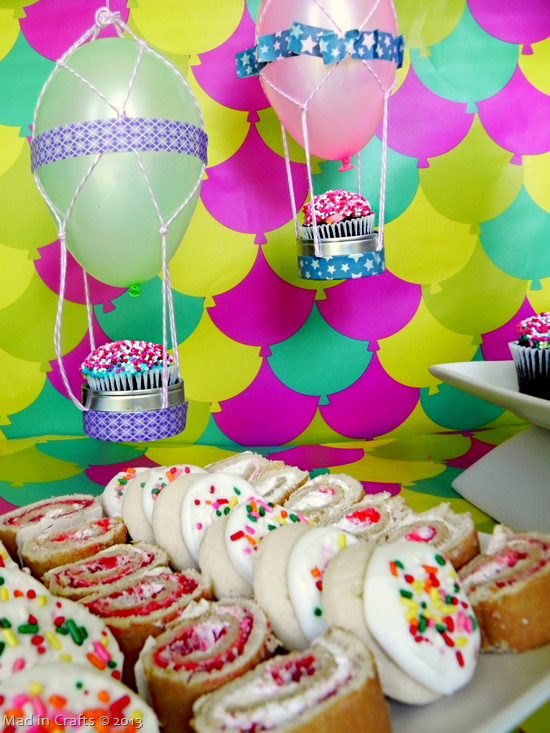 If you were making these decorations the day of your party, you might be able to get away with it. Position the top knot of twine at the top of the balloon. 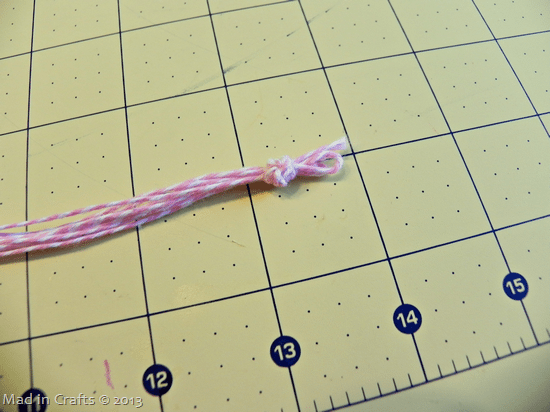 If you want to prevent the twine from slipping while you are working on the rest of the knots, you can hold it in place with a small piece of double sided tape. 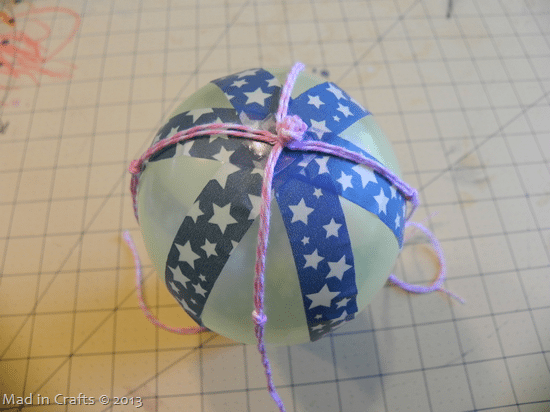 Set the balloon in a small cup so that it is easier to finish tying off your twine. 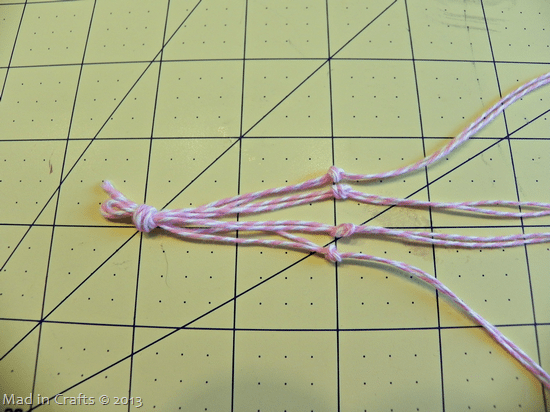 Divide the pairs of twine that you tied together previously. Tie one piece of each of those pair with one piece of the pair next to it. See the picture above if that is as clear as mud. Do the separate-and-re-tie process once more slightly further down. Take the lid off of the favor tin and remove the plastic window from the lid of the tin. 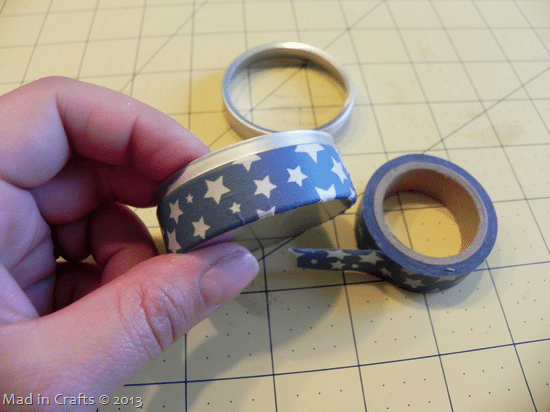 Wrap the tin with washi tape. This step is a little tricky, so don’t get frustrated if it takes you a few tries. 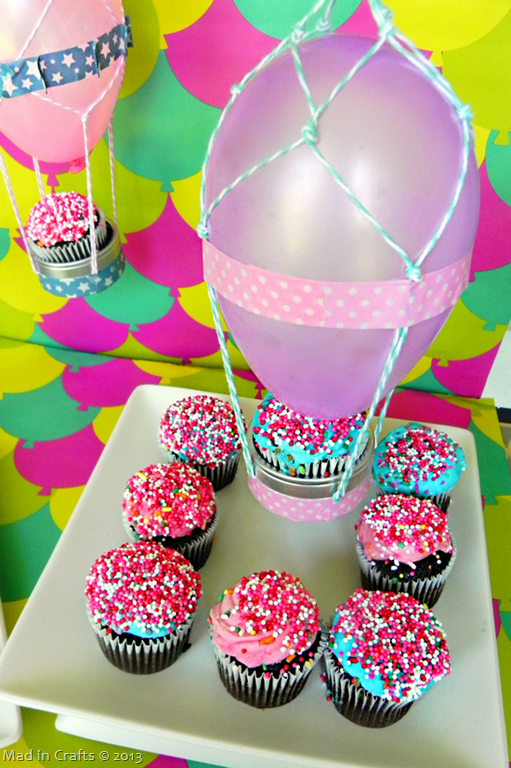 Set the tin (without its lid) on a table, and hold the balloon a few inches above it. 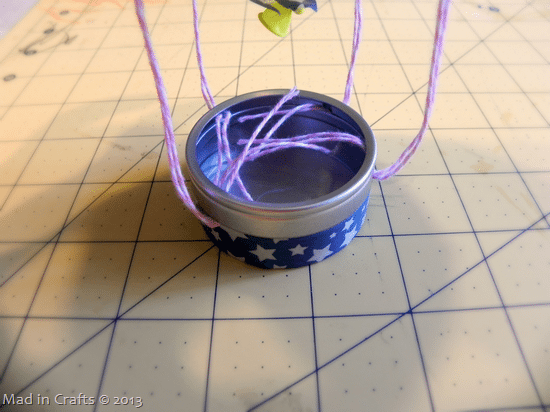 Dangle the twine so it pools into the tin. With your free hand, replace the lid and push it down to secure the twine in place. 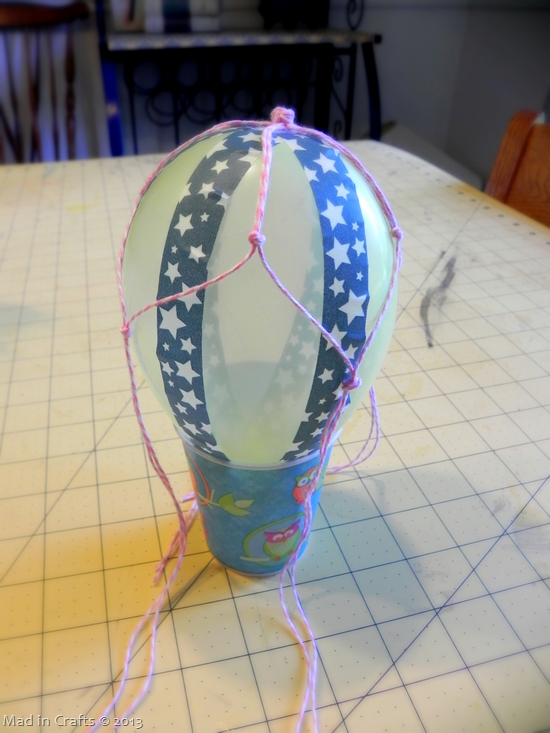 Scoot the twine around so that the “ropes” of the hot air balloon are evenly spaced. 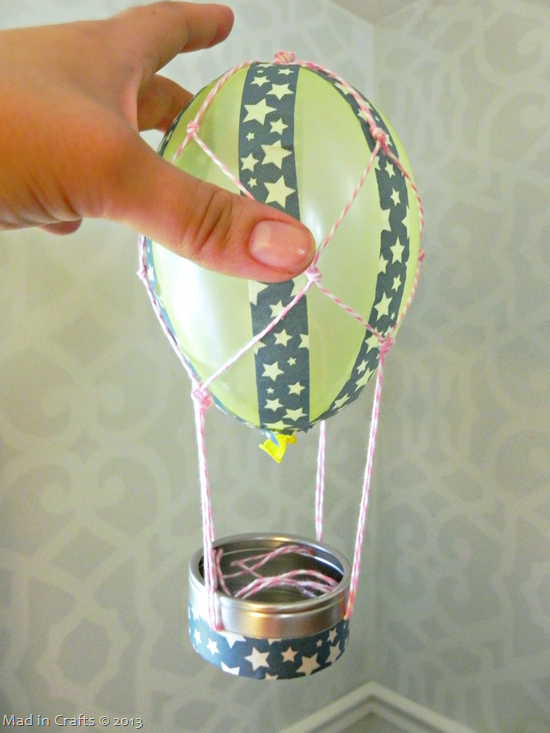 You can also adjust the twine in the tin to make the balloon “basket” hang straight. 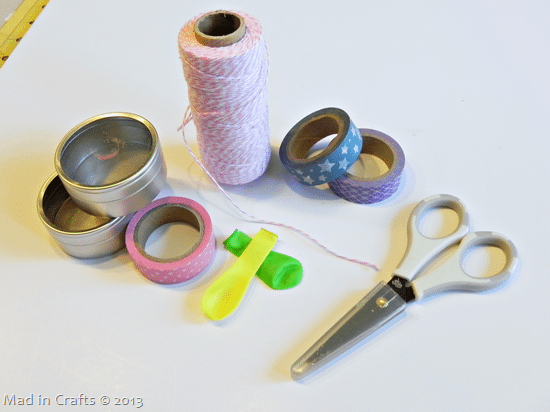 Cut a length of washi tape that is roughly 14 inches long and wrap it around the widest part of the balloon. 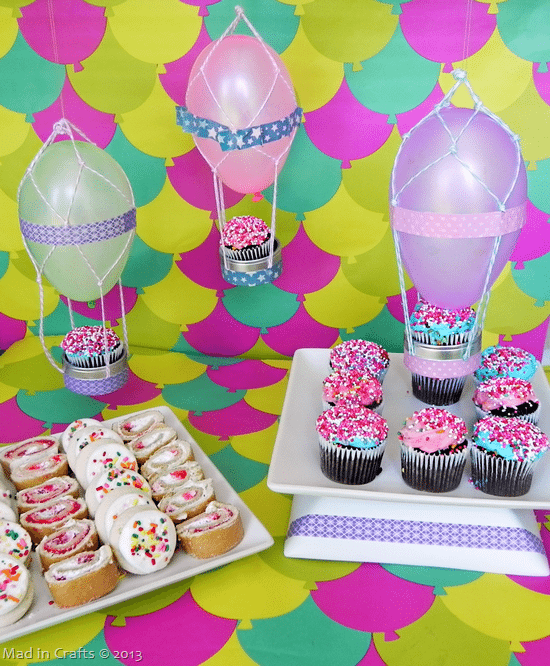 Thread some monofiliament through the top knot of the hot air balloons and hang them above your sweets table! The tins are the perfect size for mini cupcakes, so you can make it look like the cupcakes are coming in for a landing right on the table! I took help from the store for my sweets table. I bought frosted mini sugar cookies and sliced up some strawberry crème snack rolls. 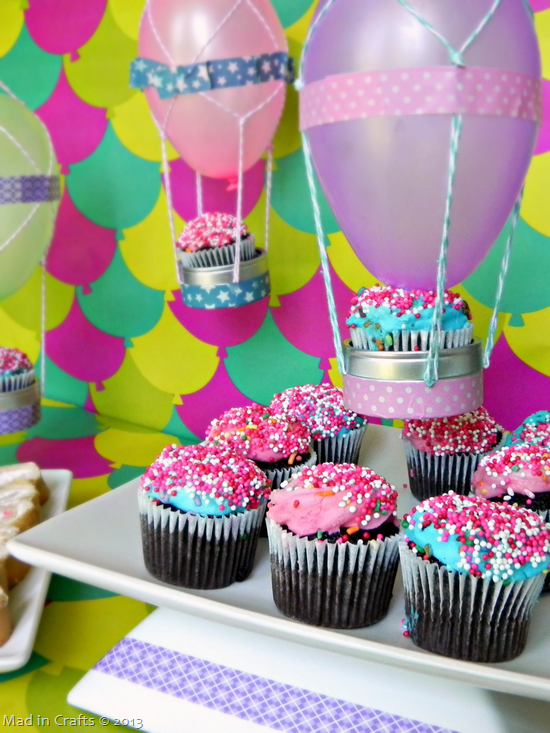 I also gave store bought mini cupcakes a quick dunk in some pretty nonpareils to give them more color (and because the lousy bagger at the store bagged the container of cupcakes in such a way that it immediately fell out of my cart upside down onto the floor – whoops). I hope I captured the color and magic of Oz the Great and Powerful in this fun dessert table. The movie is so visually stunning, it really does feel like magic. If you are interested in bring the magic of Oz into your home, you are in luck because the Blu-Ray combo pack is being released TODAY! Stay up to date on all the Oz news and fun on facebook, twitter, and pinterest. For more Oz-inspired creativity, click the thumbnails below!